Prime Minister Sheikh Hasina on Wednesday urged journalists to use their professional scope for country’s greater interest, saying the freedom of press should not to be used in a childlike manner. The prime minister was distributing cheques of financial assistance from Journalists Welfare Trust among sick, financially insolvent and injured journalists in accidents at a function at Prime Minister’s Office (PMO) in Dhaka. The premier said her government had assumed power in 2009 with a promise of changing the fate of people. Now, everybody would acknowledge that fortune of the people of the country has really changed, she said. Sheikh Hasina said her utmost goal is to materialise the dream of Father of the Nation Bangabandhu Sheikh Mujibur Rahman to build a happy and prosperous Bangladesh as she thinks it as her duty. So, she never bothered who wrote against her or in her favour. “I always do anything with self confidence asking myself the question — “Am I doing the right or wrong, and I guide myself on that principle,” the prime minister said. 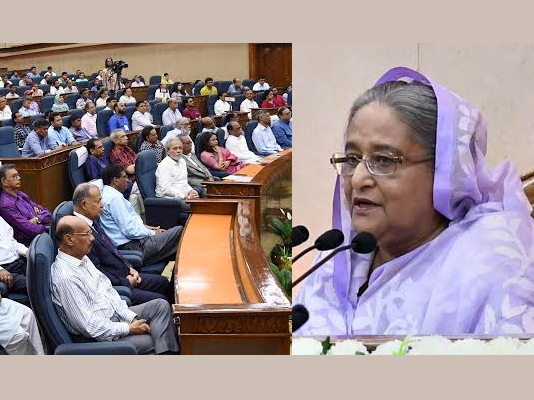 Terming the media as the mirror of the society, Sheikh Hasina said the mirror has been widened with the addition of electronic media alongside newspapers. Now media comes to light many problems of the people from far flung areas, which is really helping the government to stand beside the distressed people. The prime minister said everybody has the right to give speech, and she always believes in it. So, her government never gagged the mouth of anybody, rather has taken the necessary initiatives to protect the rights of media. Pointing out the steps taken by her government for welfare of the journalists, the premier said her government has constituted the welfare trust for the journalists in line with her experience that none stand beside them during the days of their woes, particularly when they loss job or fell in any accident. She announced giving Taka 20 crore more donation to the Bangladesh Journalists Welfare Trust Fund. Information Minister Hasanul Haq Inu presided over the function while PM’s Media Advisor Iqbal Sobhan Chowdhury, State Minister for Information Tarana Halim, Chairman of Parliamentary Standing Committee on Information Ministry AKM Rahmatullah were present as special guests. Information Secretary Abdul Malek gave welcome address while Director General of Bangladesh Journalists Welfare Trust Shah Alamgir also addressed the function, among others. President of Bangladesh Federal Union of Journalists (BFUJ) Molla Jalal, its Secretary General Saban Mahmud, President of Dhaka Union of Journalist (DUJ) Abu Jafor Surja and its General Secretary Sohel Haider Chowdhury also spoke on the occasion.